Events that overwhelm our coping capabilities even briefly, can leave their mark on our vegetative / autonomic nervous system. These traces may be inconspicuous or so significant that a person develops symptoms as a result. If so, Somatic Experiencing is able to alleviate or even eliminate a number of stress-related symptoms. Somatic Experiencing is a therapy and a personal training in working with the body's responses to stress and stimuli in general. As a therapist, I accompany you during the sessions, and I show you helpful exercises that can be integrated into your everyday life and how you can integrate them deeply. Or: helpful exercises that can be integrated into your daily life. What happens in an Somatic Experiencing session? During Somatic Experiencing sessions various gentle exercises are applied to help reduce accumulated stress in the body. Many of them involve tracking bodily sensations without being overwhelmed or being all too absorbed by the encountered sensations This is done in sitting, standing or lying positions. In a further phase, I help you move from pleasant to unpleasant sensations and back. We learn to approach both pleasant and unpleasant feelings and sensations without getting lost in either of them. (so-called ‘pendulating’). Sound and images are used to help this process. By pendulating, ‘stuck’ energy may be freed and the body moves from «stuckness» (symptoms) to more flow. Hence Somatic Experiencing creates a new internal security, which allows the body to relieve stress more easily and prevents its accumulation. 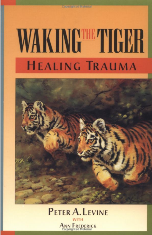 Somatic Experiencing is a form of bodywork developed by Dr. Peter Levine in the 1970s to treat the disturbing consequences of traumatic events. As a stress researcher he came to the conclusion that stress should be considered and treated as a primarily physical (somatic) phenomenon, contrary to common opinion, which regards "stress" as a psychological phenomenon that can affect one physically. Peter Levine examined the behaviour of wild running mammals and noticed that they do not develop stress or trauma disorders, even if they are repeatedly exposed to life-threatening situations. The biological, pre-programmed responses (reflexes) on threat are: escape, fight or shock reaction. These reactions are controlled autonomously, that is by the autonomic/ vegetative nervous system. Once the threat is over, the high amount of energy, which is provided in a split second for fight or flight, is dismantled by shaking, shivering, trembling etc. This is known as the completion of the stress response. If the energy is not degraded, then the stress response is not accomplished and the nervous system does not return to a healthy functioning . E.g. deep restful sleep, proper digestion, competency in relationships, normal blood pressure, heat balance, etc.